The late 19th century saw a revival in literature and art in Ireland. Drawing on the rich legacy of Irish History and Mythology, a cultural renaissance was initiated, under the influence of W. B. Yeats, George “AE” Russell, Lady Augusta Gregory and others. As well as founding the world-famous Abbey Theatre, these writers, along with Ellie Duncan, Count Casimir and Countess Constance Markievicz, founded the United Arts Club, which came into existence in 1907. Unusually for its day the Club offered full membership to men and women from the start, and was not politically or religiously aligned. The Arts Club was envisaged as “combining the unusual advantages of a social club, open to both ladies and gentlemen, with features of special interest to workers in Art, in Music, and in Literature.” It was immediately a popular success and became a home from home for practitioners of all artistic disciplines. Lively interaction, discussion and debate on all aspects of the Arts ensued, and continues to this day. 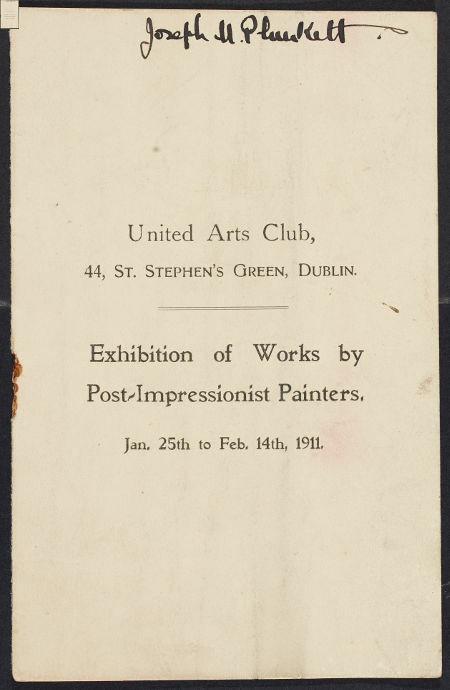 The United Arts Club membership has numbered many of Ireland’s most distinguished Artists and Writers. Many of these have served on the committee and been a major influence at home and abroad in the promotion of the Arts in Ireland. Over the years the Club became a vibrant social amenity attracting not only artists from all disciplines but also patrons of the Arts. Thanks to the generosity of some of the painters and members the Club has a small but important collection of paintings donated over the years.